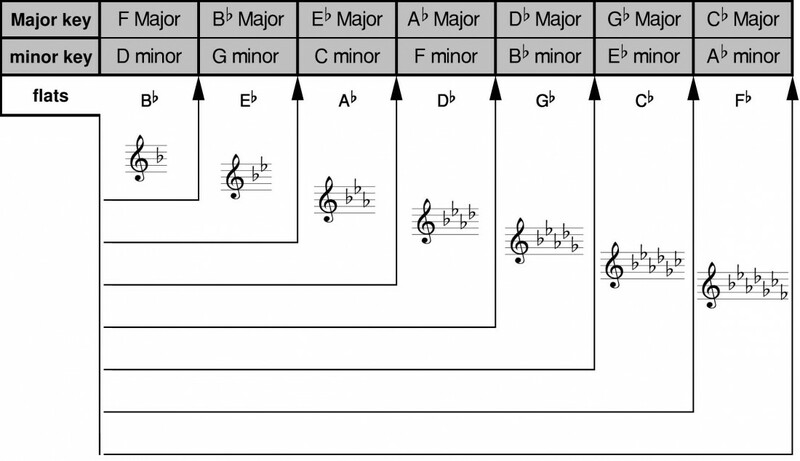 Major Scales – Most music (in the West) is based on the major scale. When a piece of music is referred to as being in a certain key, such as the key of G major, this means it is based on that scale. So a piece of music in the key of G major will therefore be based on the G major scale, a piece in the key of D major based on the scale of D major, and so on. The major scale is made up of a sequence of Tone and Semitone spaces between its notes. On the guitar a Tone is 2 frets apart while a Semitone is 1 fret apart. The major scale sequence is Tone, Tone, Semitone, Tone, Tone, Tone, Semitone (TTSTTTS for short). This formula applies to all major scales. The fret-board diagrams below give examples with A major and B flat major scales. For A major, starting on the root note of A (open string) we go up by a tone to the 2nd interval (B) and from there we go up another tone to the 3rd (C#), then up by a semitone to the 4th (D) and so on according to the TTSTTTS formula, until we are finally taken to the higher octave of our original starting note (A) on the 12th fret. The same applies to the B flat major scale by starting on the root note of B flat (1st fret A string) and applying the TTSTTTS formula. For the A major scale the notes that fall on enharmonic equivalents are known as sharps; C#, F# and G# (enharmonic equivalents are notes that can be called either sharp or flat). The reason for this is to keep the scale alphabetic in sequence; if instead “C#” was known as “Db” then there would be two kinds of D (Db and D) but no kind of C note at all. For the same reason some notes of the Bb major scale are known flats rather than sharps, to keep the scale alphabetic in sequence; if Eb was called D# instead, then there would be two kinds of D (D and D#) but no kind of E at all. Note: Normally scales on the guitar go across different strings without needing to move the hand up or down the fretboard but for the purpose of this tutorial single string versions need to be used. Note: Normally scales on the guitar go across different strings without needing to move the hand up or down the fret-board but for the purpose of this tutorial single string versions need to be used. The key signature appears at the beginning of a piece of music (between the clef and time signature). It denotes the sharps or flats within the scale that the key corresponds to. The two examples below are the key signatures for A major and B flat major. 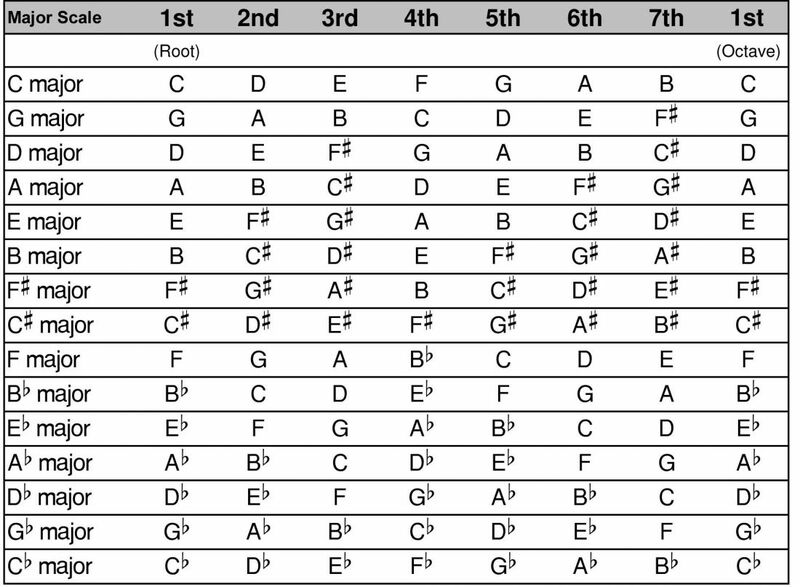 You could check the amount of sharps or flats to the corresponding scales of A major and Bb major in the chart above (Bb is only counted once in Bb major). If you know the note names of the five line staff then even better. Below are two charts for all of the Key signatures. The first chart shows key signatures that contain sharps, the second chart below shows key signatures with flats. There are also relative minor keys, which have been included for your reference. The key signature names are across the top in grey for the major keys, with minor keys just below. The sharps or flats they contain are listed underneath; e.g. B major has F#, C#, G#, D# and A# while Eb major has Bb, Eb and Ab. 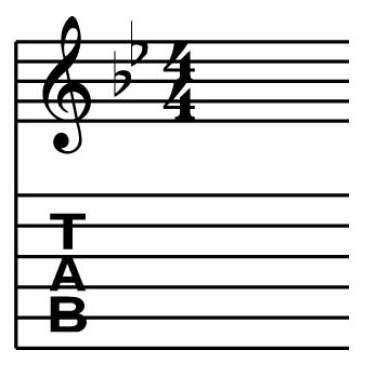 Neither the key of C major or A minor (the relative minor of C major) have been included as neither of these keys contain any sharp or flat notes (thus the key signature for these keys is no “#” or “b” indicated at all where the key signature would normally be). Supposing we don’t have the above chart to hand and only see the key signature. An easy way to work out what a major key with sharps is, is by going up a semitone from the last sharp indicated. So for a key signature in which the last sharp is A# the key is B major as B is a semitone up from A# (notice in the above chart A# is the last sharp in the key signature for B major). For major key signatures with flats the second to last flat is also the major key. 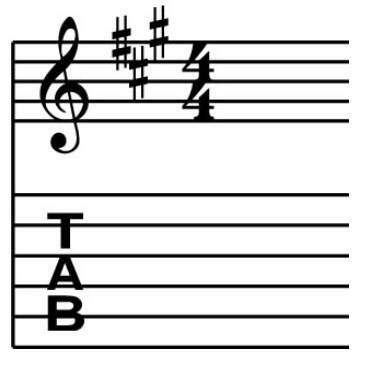 So if we see a key signature in which the second to last flat is Eb then the key is Eb major. For the key of F major there is only one flat (Bb) so this doesn’t apply and we simply have to remember that one flat for the key signature means that it is F major.